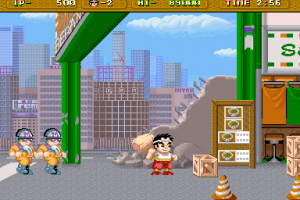 This is another puzzle-drop game along with another Japanese license heralded by Game Freak . 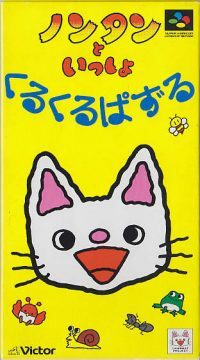 Nontan is a mischievous kitten and lead of a series of young children’s picture books first published in 1976, usually playing together with his animal pals and learning a lesson at the end. 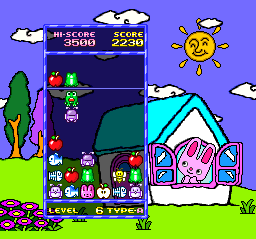 Their inclusion is merely window dressing for a charming puzzle game with a unique twist to make it stand out. A simple linked block pair of icons fall down Tetris-style, though these blocks cannot be rotated, but merely flipped to an alternate form. These can be the front and back sides of a frog or bird, whole apple and half of one, and a fish or fish bones. Matching two of the same clears them both, much like in the Yoshi puzzle game, though with a couple of sneaky curveballs thrown in. Occasionally flipping a block reveals one of the icons to be a bee or the head of the current animal pal onscreen. The bees are a nuisance since they can only be rid of when paired with another rare bee block. 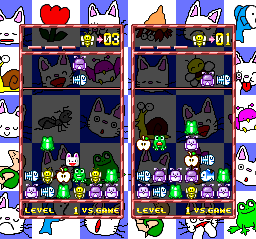 Your animal pal heads also can only be cleared with a matching pair, though it’s worth the hassle since placing two together clears a row or two of blocks completely. 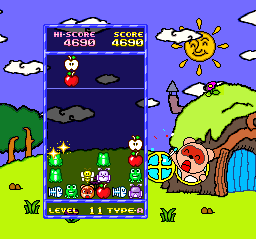 Much like Yoshi, there’s the standard endless Game A and competitive 2-player mode, along with a score game of clearing as many bee blocks as fast as possible on Game Boy. 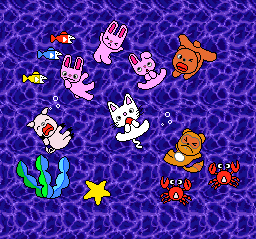 The visuals are bright and colorful, looking like they’re ripped from a children’s coloring book (at least the Super Famicom version, that is). 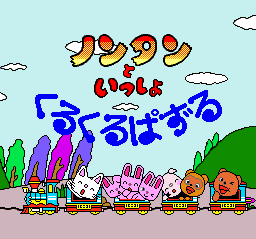 The music is cheerful and bouncy but gets repetitive over long plays. 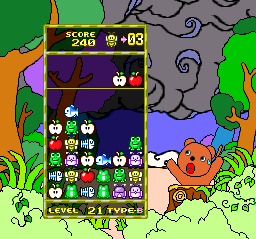 Each level switches out the character in the corner, going from Nontan to his bunny pal to tanuki, to pig, and so forth. 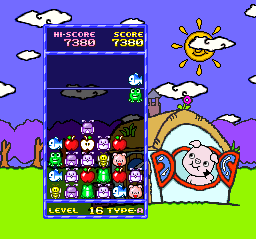 They each have little animations for matching blocks, clearing a row with their head blocks, or if you’re nearing a game over. 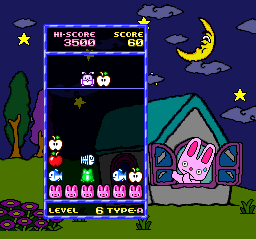 It’s all cute, and luckily doesn’t distract too much from the gameplay. It is a nice step up from their first puzzle endeavor with enough twists to keep it from getting too boring. 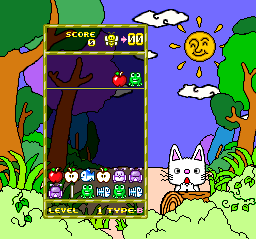 It doesn’t rank as one of the all-time greatest puzzle games, but it’s worth a try, especially if you enjoy the adorable art style. 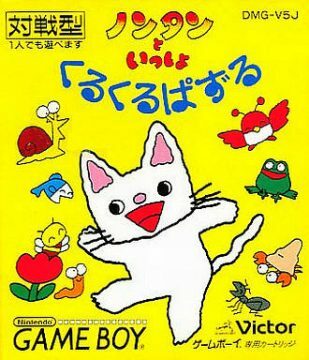 Once again, there isn’t much difference between the Super Famicom and Game Boy titles aside from better visuals and audio.